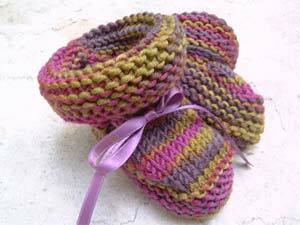 fabulous handknit baby booties in luxury fibers. Handknit baby booties in washable, ultra-soft merino wool. They stay on with soft crochet ties in the same yarn as the booty, in a gorgeous array of rainbow colors. Add a little spark of fashion to your little ones tootsies. Make it a gift at checkout with our gift wrap and custom card option!